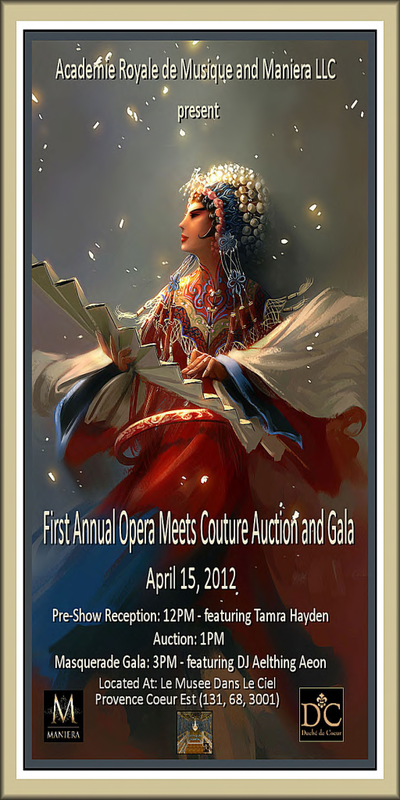 Duche de Coeur’s Academie Royale de Musique (ARM) and MANIERA LLC present the first annual Opera Meets Couture fashion show and gala. A magical night inspired by Vogue’s Night of a 1000 Stars. Please join us Sunday, April 15th starting at 12pm SLT for an afternoon filled with music, dancing and fashion. A selection of gowns from some of Second Life®‘s top designers will be sold with partial proceeds being donated to help support the Academie’s education and outreach efforts. Academie Royale de Musique supports and promotes superior music and theatre at the Duche de Coeur. The Academie’s mission primarily focuses on classical music however it showcases a variety of genre through several music appreciation and educational workshops and sessions. The Academie also produces modern and liturgical dance as well as ballet and stage plays. We are proud of our partnerships with Unity Productions (liturgical and modern dance) and KG Shine Productions (theatrical plays). Together we bring spectacular performances throughout the year. Maniera Inc. is a premier Second Life® fashion and lifestyle corporation with three subsidiary companies including: Maniera Magazine, Maniera Model Management and Maniera Institute of Style. For all business inquiries, please contact Topaz Joubert, CEO of Maniera Inc.
MANIERA MAGAZINE is one of Second Life®’s top fashion and lifestyle magazines with a distribution of over 30,000 in world. We were the first themed magazine in Second Life® and boast a staff of professionals in their field not only in Second Life® but in real life as well. We raise the bar of Second Life®’s magazine publishing industry by demanding excellence in our professional writing, expert photography and sleek design. Maniera Magazine is published Inworld Monthly and also on the world wide web via Issuu. This entry was posted in Events & Contests, Fashion and tagged 3D, 3D people, Academie Royale de Musique, Art, avatar, Blog, Blogger, Clothing, Couture, Fashion, Fashion in Pixels, fashion poses, Female Clothing, female wear, Formal, formal attire, Hair, High Fashion, Jewelry, Maniera, meta virtual, Model, model pose, Model Poses, Modeling, Modeling pose, Modeling Poses, New, New Release, New Releases, News, Opera meets Couture, photographer, Pose, Second Life, Secondlife, SL, SL Clothing, SL Fashion, SL Style, Style, Theatre, Virtual World, Wicca Merlin, woman. Bookmark the permalink.